Jacki Davidoff is the Principal and Senior Consultant of Davidoff Mission-Driven Business Strategy. With 30 years of experience bridging nonprofit and corporate positions, Jacki has experience leading national advertising agencies and senior executive positions in Chicagoland nonprofits. Jacki leads organizations to strengthen relationships among staff and with external audiences through Davidoff’s Mission-Driven process to articulate their potential. Prior to joining Davidoff Strategy, Jacki completed nine years at the Chicago Botanic Garden where she worked in leadership roles in marketing, communications, and corporate/foundation fundraising, increasing the organization’s national and regional presence and growing its corporate support to record levels. 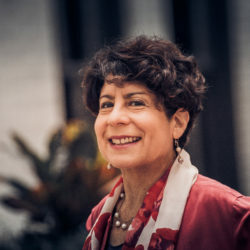 Jacki has provided leadership in strategy and marketing for the Association of Fundraising Professionals, Executives’ Club of Chicago, Forefront, Illinois Children’s Healthcare Foundation, and Jewish Council for Youth Services, among others. Jacki serves on the board of Chicago Women in Philanthropy and the Philanthropy Club of Chicago. She is active in the American Marketing Association, Association Forum, The Executives’ Club of Chicago, and Conscious Capitalism. Jacki is from Houston, Texas and earned her BS in Advertising with highest honors from the University of Illinois at Urbana-Champaign. She completed her Masters in Transformational Leadership and Coaching at Wright Graduate University for the Realization of Human Potential in July 2017. Jacki lives in Evanston with business partner and husband John, and their two sons.